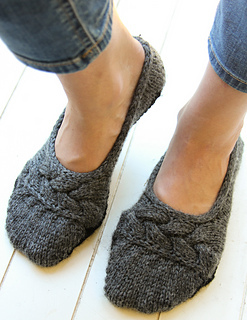 The house slipper of your dreams! 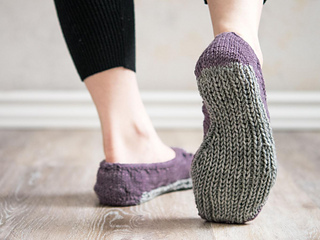 Cute and comfy to wear - quick and seamless to knit! 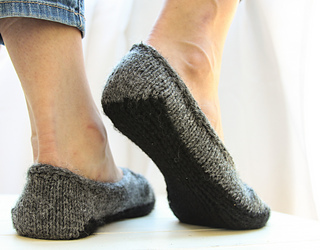 Whip up a pair for you and a friend and get walking on the cloud nine sole! 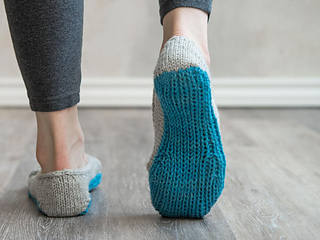 These ballet slippers boast a stylish top and a comfy double-knit (see below) sole. 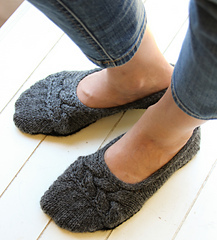 They also are knit seamlessly with short row shaping (using the German Short Rows method). (Instructions in pattern.) 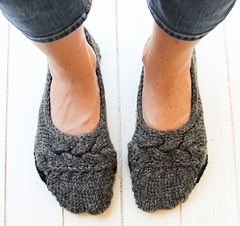 First work the toe, then the sole, shoe back, short row shaped sides, and cabled braid. Finish off with a decorative I-cord BO. 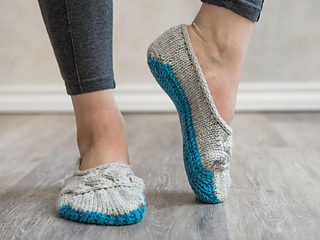 The pattern includes both charted and written instructions. Techniques used: Knit, purl, provisional CO, German Short Rows (instructions in pattern), cabling, Kitchener St, working in the round, I-cord BO. Note: If substituting yarn, please note that this yarn is thinner than a traditional bulky yarn. It knits up more like a thick Aran weight yarn.